Summer season is not over yet so let’s talk about beating the summer heat away…wasn’t able to join my colleagues in their Subic and Pagudpud escapade and I know that summer days are finally coming to a close…so tomorrow, me and my friends are going to have some wet and wild fun…we’re going to Splash Island in Biñan, Laguna…we are going to beat the summer heat away from the pollution and noise of Metro Manila…and besides, what is a summer holiday without going to a beach resort or public swimming pool to cool off? 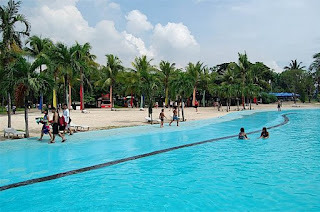 Located at the Southwoods Ecocentrum in Biñan, Laguna, Splash Island is known as the largest water park in the country. Getting there is easy as it is only some nine kilometers after the Filinvest Toll Plaza along the South Super Highway. Splash Island contains more than 12 water attractions and can accommodate 6,000 guests at any given time. Among the attractions are the Dos Supremos and King Pilipit slides with plenty of turns and giant twisters. The Big Bam Boo, Twisted Palms and Tausug Trails offer riders on inner tubes with thrilling back-to-back 360 degree turns, full circle curves and down-the-tube dives. For those who opt for edge-of-your-seat thrills, they can trythe Magellan’s Drop – a long, four-level slide where riders race their way to pool level. There’s a special place for youngsters where at least six attractions around the park are designed in a kid-friendly way. The Curl of the Orient, Camp Carambola and the Twin Coco Knots are actually baby versions of the big slides. In Bannakita, children can have a river adventure while the Boon Docks gives them a delightful wilderness expedition. On the other hand, the tykes will have the time of their lives in the Water Wahoo attraction, an interactive kiddie pool with innovative water play activities. A great deal of park habitues find relaxation in the Balsa River floating easy on a raft as they drift along the gently flowing river around the park which flows at a pace of three miles per hour. Another group ride attraction is the Rio Montanosa, a breathtaking mountain high river raft ride the entire family will rave about. In addition, the grand entertainment package comes with high-level security and convenience where the park employs close to a hundred pool technicians, life guards, guest relations officers and security personnel. After all those exciting slipping, sliding and splashing, guests can recharge at the Fiesta sa Pulo were a sumptuous feast is served. Bringing food into the park is not allowed but there are numerous food establishments that serve food at reasonable prices. Clean water is assured through a centralized filtration system located at the center of the park. A team of pool technicians perform an hourly check on the water to make sure that it is healthy for treading. During its first year of operation, it has received an excellent rating on aquatic safety from Jeff Ellis and Associates, Inc. of Texas, a highly-acclaimed international aquatic safety consulting firm. ganyan ka naman e. ikaw lang ang babating sut. sino kasama mo? siguro yung BF mo no? Hi, it’s a very nice blog. I loved this place…. wish I could be there one day.